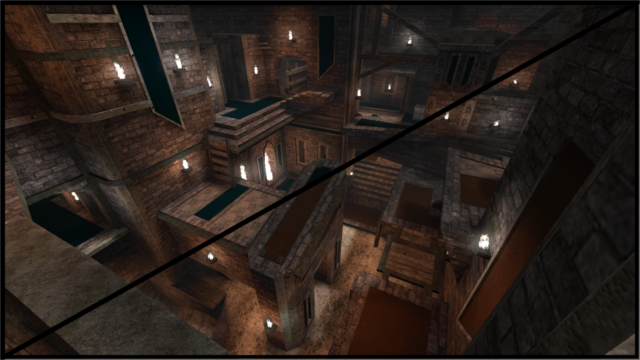 This project started as a capture map (Fallen), but then was flipped and mirrored to suit CTF gameplay (rkc2). Both versions are included in the zip. Feedback is welcome, enjoy. Amazing map, it makes me feel im playing the old classic unreal tournament, but with a more modern design. The lights could be a bit more alive, perhaps in the ctf version you should change the color of the torches, because the blue and red textures aren't so intense as those fires to identify bases. The white color or derivates are always boring colors for lights, so trying to avoid them could be a good idea. Anyways it's a nice map, i think the only thing this map needs is just more life and make some places wider.